seedleSs has stood for decades as a pinnacle of “High Society”, and now you can enjoy their BuddaBox full of amazing goodies! BuddaBox have done it again. They continue teaming up with big names to deliver the greatest ganja gear the globe has ever known. Their latest victory? 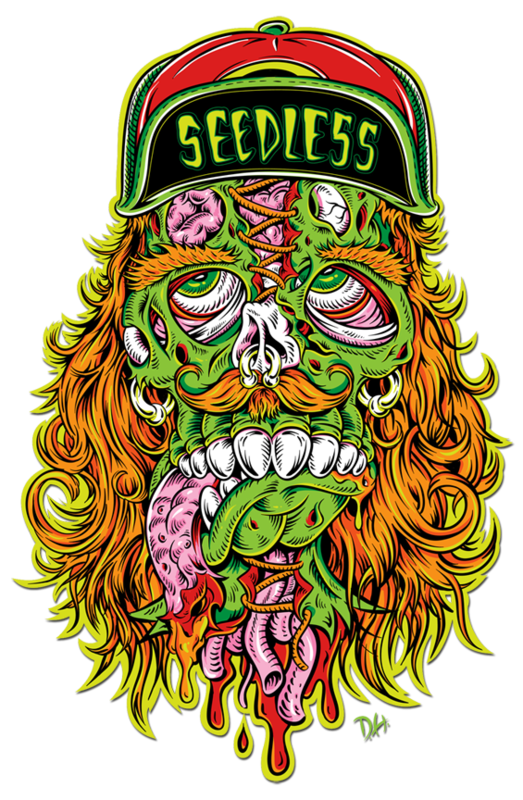 seedleSs Clothing. A name every herb lover knows intimately, seedleSs has stood for decades as a pinnacle of “High Society”, and now you can enjoy their Budda-built box of goodies! Founded in 1992 in Ocean Beach, California, seedleSs Clothing has grown from a small idea into a huge force in the cannabis community. With the inauguration of the seedleSs 420 Party in 2001, they have spun a thread of enthusiasm and culture into our lives that continues to live on. For almost 25 years, seedleSs has inspired with art that changes the way we look at cannabis. Now, thanks to the seedleSs slaPak, you can get some of that exclusive art, designed by industry legend Dane Holmquist. But this seedleSs slaPak goes a step beyond even that. This pack gets the mood going for the action and horror packed season of Halloween with unique art. Jason, Freddy, Pinhead… all your favorite baddies come together for a cannabis subscription box to treasure. With high-quality merchandise, monthly events, giveaways, special collaborations, and tons of gear, what’s not to love? BuddaBox backs up their creativity with outstanding customer service and a money-back guarantee. From phone support to Facebook messaging, email to Snapchat, these guys have you covered. Ultra-discreet shipping means you never have to worry about the neighbors getting jealous. Unless that is, you invite them over for a bowl. For the best smoking gear, with all of the perks of discrete doorstep delivery, BuddaBox brings you more of what you love, for less. We created BuddaBox for people like us. People that hobby, even obsess over their 420 experience. And that they have accomplished, in spades. Go to BuddaBox and grab the latest creative collection of cannabis crafted gear. Don’t forget to check out their awesome Snapchat @buddabox420. Want more, HERB readers? Punch in the promo code BUDDABOX10 for 10% off your first box or subscription. What ideas do you have for an awesome themed BuddaBox? Share with us on Facebook, Twitter, or in the comments below.